Darlene Sue Dace, age 83, of Anthonies Mill, Missouri, went to be with the Lord on Thursday, November 15, 2018. Darlene was born on December 22, 1934 in Stanton, MO, to the late James Earl and Eva Dorothy (Gallinger) Woodcock. 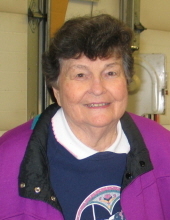 She grew up and attended 1st-8th grade in Stanton and graduated from Sullivan High school in 1952. She was valedictorian of her 8th grade class. During her high school years, she was a catcher on the softball team and also played volleyball. Darlene married Tracy Donald (Don) Dace, Sr. of Anthonies Mill on September 28, 1952 in Yuma, Arizona and they were blessed with 4 children. Darlene & Don lived in San Diego, CA, where Don was stationed in the Navy at Miramar Naval Base. In 1954, they returned to the Sullivan, MO area to live until 1959. They lived at Anthonies Mill until 1972, where they again moved north of Bourbon and lived for 42 years. In 2014, they moved back to Brazil Creek at Anthonies Mill. Darlene was a homemaker until her fourth child was born. She worked as a secretary & librarian in the Bourbon School District, a secretary at Woodland Lakes and also worked at the Livestock Barns of St. James & Cuba. Darlene was an avid gardener and loved her flowers. She was a Cub Scout Leader, worked as a Sunday school teacher, church treasurer, Bible school teacher and worked in the bus ministry. Darlene loved poetry and was known to recite a poem or two from her school years. She even wrote a couple of poems, possessing creativity and the ability to educate. Darlene loved to teach her kids and grandchildren and always wished she had become a teacher. Darlene is survived by her husband Don of 66 years; one daughter, Deborah (Paul) Shasserre of Cuba; 3 sons, Tracy D. Dace, Jr. of Anthonies Mill, Douglas (Kirsten) Dace of Sullivan, and Daron (Marla) Dace of Anthonies Mill; 7 grandchildren, Wesley Swyers of Cuba, MO, Tracy D. Dace III of Bourbon, MO, Jeremy (Sandra) Dace of Sullivan, Sarah Dace of Sullivan, D.J. (Taylor) Dace of New Madrid, MO, Nathan Dace of Columbia, MO, and Joshua Dace of Columbia, MO; 5 great-grandchildren, Davin Swyers of Cuba, MO, Stormy Swyers of Steelville, MO, Mya Swyers of Steelville, MO, Zoe Swyers of Steelville, MO, and Tracy D. Dace IV of Bourbon, MO; one brother, David Woodcock of St. Louis, MO; sister-in-law & brother-in-law, Verna (Dace) & Eddie Gene Schmidt of Sullivan, MO; special friends, Martha & Larry Greenwalt; many nieces & nephews, other relatives & friends. She was preceded in death by her parents, Earl & Dorothy Woodcock; in-laws, Tracy & Deveda Dace; one grandson, Karl Swyers; 3 brothers, Frank Woodcock, Sr., Kenneth Woodcock & Arnold Woodcock, Sr.; one niece, Karen (Woodcock) Boevingloh; sister & brother-in-law, Pauline & Charles Ferry; and sisters-in-law, Pat Woodcock & Jane (Dace) Schatz. Funeral Services will be conducted 11:00 AM, Tuesday, November 20, 2018 at First Baptist Church in Bourbon, with Mr. Mike King and Mr. Ray L. Schatz officiating. Interment will follow in Anthonies Mill Cemetery in Bourbon, MO. Visitation will be held from 4:00 PM to 8:00 PM, Monday, November 19, 2018 at the Eaton Funeral Home in Sullivan. Memorial contributions, in memory of Darlene, may be given to Susan G. Komen or St. Jude Children's Hospital. To send flowers or a remembrance gift to the family of Darlene S. Dace, please visit our Tribute Store. "Email Address" would like to share the life celebration of Darlene S. Dace. Click on the "link" to go to share a favorite memory or leave a condolence message for the family.